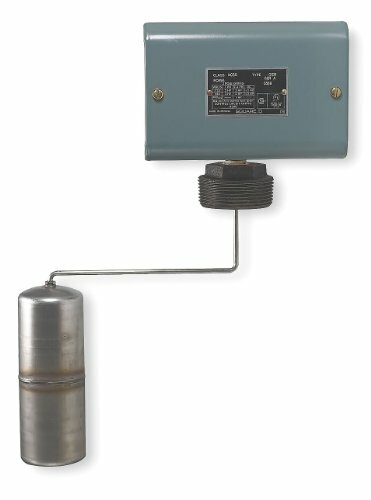 This liquid level switch is designed for horizontal open tank mounting. It offers a means of mechanically altering the operation of two pumps installed in a duplex system with a common tank. This listing is for each. Technical Specification Item Alternator Tank Liquid Level Switch Switch Function Close On Rise Mounting Side Float Position Left Float Rod Angle 90 Degrees Float Travel 6-1/2' Tank Connection Size 2-1/2' MNPT NEMA Rating 1 Contact Form DPST Operating Temp. Range 250 Degrees F Max Max. Pressure 50 psi Overall Length 17.81' Float Material Stainless Steel Float Length 7.00' Float Dia. 2.50' Stem Material Stainless Steel Stem Length 4.00' Height 5.94' Width 6.84' Max. Current 600A Max. Voltage 600 HP @ 1 Phase - 120V 2 HP @ 1 Phase - 240V 3 HP @ 3 Phase - 240V 5 Body Material Steel Conduit Size 8-1/2', 8-3/4' Electrical Connections Screw Clamp Features Viton Packing for Media Temperature Up To 250 F Includes Viton Packing - Rod and Float Compliance and Restrictions This item is manufactured or supplied by a minority, woman or disadvantaged business.